The nation’s 41st president died late Friday (Nov. 30) at the age of 94 after a series of health complications. George Herbert Walker (H.W.) 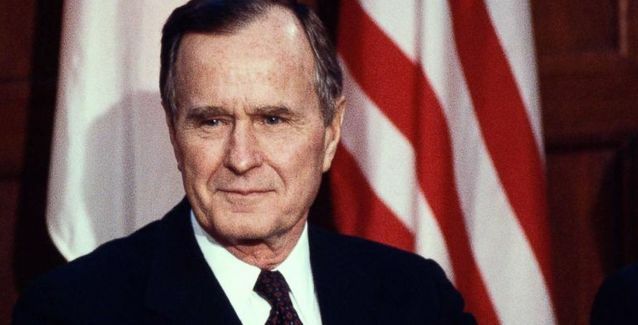 Bush was elected president in 1988 and served one term. He was vice-president for two terms under his predecessor, President Ronald Reagan. He was also the father of the 43rd president, George W. Bush. Bush was born in Milton, Mass., on June 12, 1924. After the Japanese bombed Pearl Harbor, Bush postponed his university studies at Yale and joined the U.S. Navy as an aviator during World War II. His plane was shot down in the Pacific Ocean in 1944 during the war and he earned the highly-respected Distinguished Flying Cross for his bravery. In 1945, he married Barbara Pierce Bush, who passed away eight months ago after 73 years of marriage. The couple moved to west Texas, where Bush made his fortune in the oil business. That catapulted him into public service as he was elected as a Republican to the U.S. Congress, serving two terms before a failed U.S. Senate bid. He was appointed by President Richard Nixon as ambassador to the United Nations. President Gerald Ford tapped Bush to be ambassador to China before asking him to lead the Central Intelligence Agency. A former chairman of the Republican National Committee, Bush ran for President in 1980, but lost to Reagan, who added him as a running mate to the successful ticket. Bush served two terms as vice-president before being elected president in 1988. He didn’t serve a second term. Bush was defeated by an ambitious Arkansas governor named Bill Clinton, although the two became close friends in their post-presidencies. Bush’s presidential record is layered with a number of significant international efforts. He successfully guided the U.S.-led coalition forces in the Gulf War after Saddam Hussein’s Iraq invaded Kuwait in 1990. He continued good relations with the former Soviet Union as it moved towards democracy. “Hillary and I mourn the passing of President George H.W. Bush, and give thanks for his great long life of service, love, and friendship. I will be forever grateful for the friendship we formed. From the moment I met him as a young governor invited to his home in Kennebunkport, I was struck by the kindness he showed to Chelsea, by his innate and genuine decency, and by his devotion to Barbara, his children, and their growing brood. “Few Americans have been — or will ever be — able to match President Bush’s record of service to the United States and the joy he took every day from it; from his military service in World War II, to his work in Congress, the United Nations, China, the Central Intelligence Agency, the Vice Presidency and the Presidency, where he worked to move the post Cold War world toward greater unity, peace, and freedom. U.S. Rep. French Hill, R-Little Rock, who served in the Bush White House, said, “It’s with heavy hearts that Martha and I mourn the passing of a loyal friend, mentor, and faithful servant, President George H.W. Bush. We lift up the Bush family during this time of grieving and honor the remarkable life and legacy of a strong leader and diplomat, a great father, and an American patriot. Talk Business & Politics will update this story later today.